Self-represented litigants often need more information than front-line staff can provide. Librarians at the Wisconsin State Law Library help by providing access to legal information and assisting litigants with locating organizations which provide legal services. The Library is making it easier to refer people to our services with our public service desk handout. Our new half sheet flier gives a brief description of the type of help we can provide along with essential contact information. The handout can be printed in black and white or color, and can be cut in half for easy distribution at public service desks, such as Clerk of Court service windows. The fliers can be downloaded or printed from our website in grayscale or color. 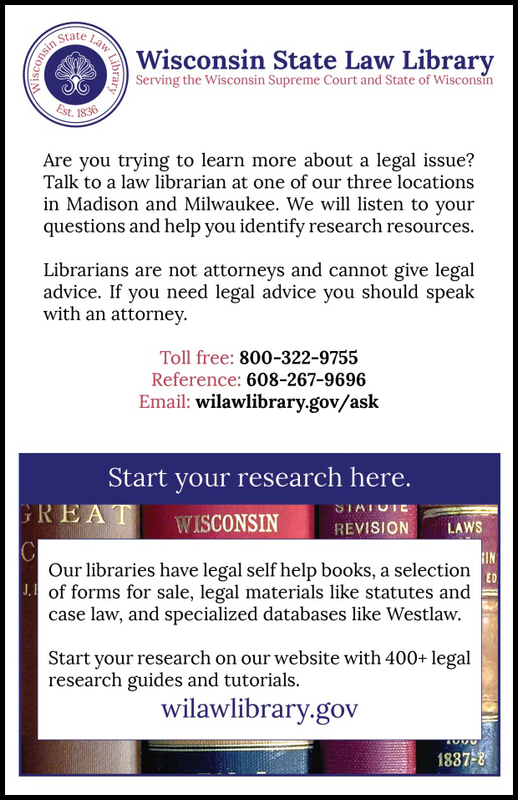 Part of the Wisconsin State Law Library’s mission is to facilitate equal access to the law by providing access to trusted sources. Over half of our research requests originate from the general public, who need information on a wide range of topics. Use this handout for a quick and easy referral to the Library’s services. On March 1st, attend 60 Tips, Sites, and Apps in 60 Minutes, a rapid fire presentation of search tips, websites, and apps of interest to the legal researcher. Presented by Beverly Butula from Davis & Kuelthau, this session focuses on introducing attendees to resources that will assist both their online efficiency and day-to-day production. This free CLE-credit class is offered by the Milwaukee County Law Library and will be held on March 1st from noon to 1:00 p.m. in Meeting Room 1 at the Central Library, 814 W. Wisconsin Ave, Milwaukee. Tuesday's Advanced Westlaw class has been canceled due to poor travel conditions. This class will be offered again on Tuesday, May 15 from noon - 1 p.m. Learn more and register on our Classes page. The next statewide election is on Tuesday, February 20th. Check My Vote Wisconsin to see if you're registered to vote, find your polling place, and look at a sample ballot. The statewide ballot item is for Justice of the Supreme Court. Two other judicial primaries are also running in Columbia and Manitowoc counties. Learn more about who's on the ballot for the February 20 primary and the upcoming election on April 3 on the Wisconsin Election Commission's Spring 2018 Election page. The February issue of WSLL @ Your Service is now online. As always, your comments are welcome. Please direct them to the editor, Carol Hassler.